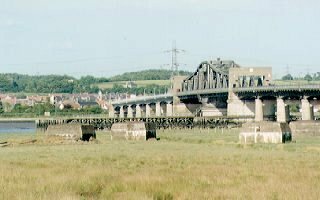 Representing the first road crossing of the Firth of Forth, the Kincardine Bridge spans the river at Kincardine on Forth, 3 miles (5 km) north of Grangemouth and 10 miles (16 km) southeast of Stirling. The bridge conveys around 24,000 vehicles per day along the A876 from Fife to the M876 and M9 motorways in Falkirk Council Area. It was built between 1932 and 1936 to a design by Sir Alexander Gibb & Partners. Its central section represented the largest swing-bridge in Europe when it was built. Operated from a control-cabin in the gantry above the bridge, it would open to allow large ships to pass upstream to Alloa, but has not been used since the late 1980s, following the closure of that port.